The tradition started at RJDS, and commemorates the life of a former student in the Jewish community who was known for her kindness and generosity to others. Last October, two teachers struck up a conversation and introduced the idea of bringing their students together. “We were reluctant, we weren’t sure how it would be received,” said Richmond Jewish Day School teacher Shoshanna Burton. Az-Zahhra teacher Sukhaina Jaffer said by bringing the students together, they are having important conversations, even if they are just about kid stuff. 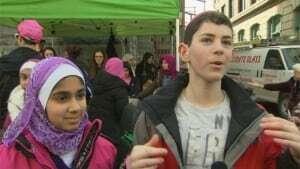 “I thought it was a really good idea because it was our Jewish school and their Muslim school coming together,”said Richmond Jewish Day School student Abe Ravvin. The work is also being well received. Downtown Eastside resident Fred Miller said he appreciates the good will. “If Muslim and Jewish kids can live together why can’t the rest of theworld live together,” he said. The two schools say they are planning to work together on future projects, building on what they have in common.